Guests Love Anaheim, CA Hotel's Great LocationWhen you stay in this hotel's suites near Disneyland� Resort in Anaheim, you don't have to sacrifice resort-quality atmosphere for an affordable price. 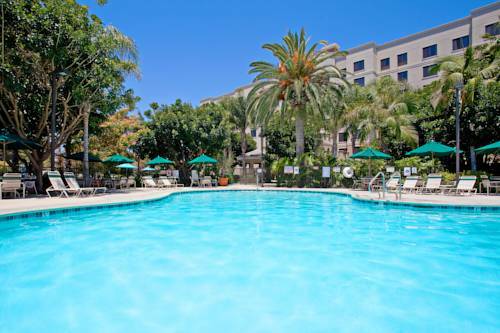 The Staybridge Suites� Anaheim - Resort Area hotel provides easy access to area attractions and is only one mile from Angel Stadium, home of the L.A. Angels.The hotel's location near Disneyland� Resort in Anaheim is ideal for leisure travelers. Take advantage of the Anaheim Resort Transit, which stops by the hotel every 20 minutes, for convenient and affordable travel to Disney California Adventure Park, Disneyland� Resort and more.Business guests visiting for job training or relocation can enjoy the extended stay at this hotel, which is just a few miles from the Disneyland� Resort. Hotel guests in Anaheim can meet clients at the Honda Center to catch a Ducks hockey game and unwind after a long day of meetings. The hotel's central location just two miles from the Anaheim Convention Center makes corporate travel in the area convenient and stress-free.Whether you are relaxing under the shade of a palm tree by the outdoor pool and seating area or working up a sweat in the on-site Fitness Center, this Disneyland� Resort area hotel in Anaheim has something for everyone. Book your reservation with us today and count on a fun and exciting trip!As to Disney photos, logos, properties: �Disney. Shops, restaurants and movie theaters ranging from Nieman Marcus Last Call, Hollister, Old Navy to Alcatraz Brewery, Dave and Busters and Market Broiler.